Bringing a moment of calm to my incredibly hectic day! This collection is gorgeous, absolutely. So beautiful hun! Thank you for all of this lightness! what a beautiful selection. 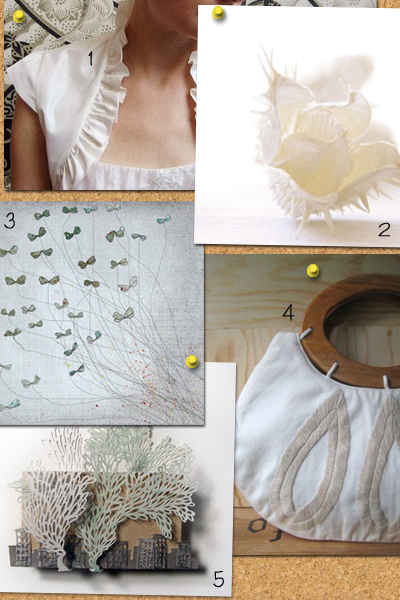 the "cut and run" and butterflies pieces especially resonate with me. thank you! Thanks Anne, man I still wish I had a dog so I could dress it up in one of your hats! Hi Michelle, glad you like these picks! Oh no Amy, hope you get some R&R soon! hi Heather!! Thanks for stopping by. Melis, me and you are soooo on the same page today. Michelle, me too! me too! the shrug is incredibly beautiful!! hi Adriana, Franz Finnegan K. That's a great name! !